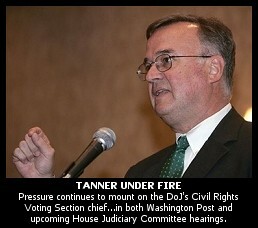 " DoJ's John 'Minorities Die First' Tanner to Testify to House Judiciary Sub-Committee, as Washington Post Picks up BRAD BLOG Story on His Recent Controversial Comments	"
Still more folks are beginning to notice our disturbing Monday exclusive, including both the Washington Post and the U.S. House Judiciary Committee, which will be taking up the matter, we are told (and a report at TPM Muckraker confirms), in upcoming sub-committee hearings. While many blogs had covered our report, the MSM had yet to ring in until today's report from Al Kamen at Washington Post who picks up on our coverage of the recent controversial video-taped comments by John Tanner, the Chief of the Voting Rights section of the DoJ's Civil Rights division. Tanner said last Friday in Los Angeles at the National Latino Congresso --- and our own Alan Breslauer was there with video camera and tough questions --- that while it's a "shame" that the elderly may be disenfranchised by restrictive Photo ID laws at the polling place, minorities needn't worry, as they are less disenfranchised, if only because "minorities don't become elderly. The way that white people do. They die first." The argument Tanner was making implied that, somehow, it's white voters who are more disenfranchised by such restrictions, rather than black voters. And, despite actual evidence to the contrary, somehow, that's all okay with him in any case, even as the GOP pushes for more such laws all across the country, with a presidential election year upon us, little if any evidence of actual voter fraud that would be deterred by such laws, and some 10 to 30 million legally registered American voters (most, coincidentally, Democratic-leaning) who might well be disenfranchised in the bargain. That from, yes, the Bush DoJ's Civil Rights Division Voting Section chief. Unlike so many other MSM outlets who have picked up on our stories before, WaPo's Kamen properly attributes The BRAD BLOG, twice, concluding his column today with: "Please, take a moment --- you owe it to yourself as a citizen --- to watch Tanner's illuminating analysis on this issue at http://www.bradblog.com/?p=5145." But Paul Kiel has still more goodies on all of this, including confirmation that the DoJ has now agreed to allow Tanner to testify at an upcoming House Judiciary Committee hearing, despite having rebuffed such an invitation previously. Moreover, The BRAD BLOG can confirm that, in fact, the committee has requested a copy of the video of Tanner's comments for possible use during the hearing to be held by the House Judiciary Subcommittee on the Constitution, Civil Rights, and Civil Liberties. Kiel covers the extremely unusual 2005 letter, written by Tanner, to "Ohio's election officials to publicly assure them that the Justice Department had found no evidence of intentional African-American voter disenfranchisement in the 2004 election." We covered the letter, and John Conyers' "flabbergasted" letter in response to it, at the time, by describing the DoJ report as a "whitewash." That, of course, was when nobody was covering this business, for the most part, other than your humble BRAD BLOGger, and a few other "conspiracy theorists" in Ohio (note: that was sarcasm). The TPM Muckraker report today (and frankly much of what has been revealed at the DoJ ever since that 2005 letter) confirms our initial take on it, way back then, to be rather prescient. We wrote about Tanner's letter at that time that "we find this small indication of what the DoJ is now made of to be particularly troubling." Not only was that an unprecedented move, former Department lawyers say, but the letter is another, and particularly galling, example of Tanner using the force of the Department to further Republican aims --- in this case, to hamper future lawsuits or investigations concerning the problems in Columbus. "It really looked like the Civil Rights Division was used to run interference for Republican election officials in Ohio," former voting rights section deputy chief Bob Kengle told me. This should all come as encouraging news to the Ohio activists who are still seeking justice from the new Democratic Secretary of State, Jennifer Brunner, and new Democratic Ohio AG, Marc Dann, as we recently discussed. Toby Moore, formerly a redistricting expert with the section who worked on the Ohio investigation with Tanner, called that a "convenient" explanation seized on by Tanner. "I never saw any indication that he was really investigating that," Moore said. Suspiciously, Tanner, the chief of the section, seems to have been the only section attorney investigating the matter. Moore, who traveled with Tanner to Ohio, said that no other lawyer came along on the trip and that he dealt with no one else on the investigation except for Tanner: "This was not handled the way other investigations were handled." Bob Kengle, who spent more than 20 years in the Civil Rights Division, said that he couldn't think of another type of investigation where no line attorney was assigned. But that wasn't the only first for the investigation. Kengle and Rich both said that the very composition of such a detailed letter was unprecedented. "Tanner bent over backwards to rule that black voters did not have a right to the same number of machines as white registered voters, and then went out of his way to make that ruling public," said David Becker, a former attorney with the section, currently with People for the American Way. "It's one of the most remarkably disconcerting things to come out of the voting section in a long time." All of this should make for interesting hearings in the Judiciary sub-committee, which has not yet announced a scheduled date for Tanner's appearance. As we're a bit under the weather, as well as being on the road today, we'll encourage you to read Kiel's full piece, which ends with this very troubling question --- even if it's not an all together surprising one for long-time BRAD BLOG readers --- from Tanner's Ohio traveling companion, Moore: "[D]id black precincts get neglected? I know we didn’t try very hard to find out." « PREVIOUS STORY "VIDEO: 'Jesus Loves You,' Says Missouri Official to Reporter, in Response to...Something Else Entirely..."
"DoJ's John 'Minorities Die First' Tanner to Testify to House Judiciary Sub-Committee, as Washington Post Picks up BRAD BLOG Story on His Recent Controversial Comments"
Brad - Thanks for your ever intrepid coverage of otherwise little known issues that hold great import in the world of election integrity. This is an incredible example of how the neocons have very deliberately and systematically disenfranchised just enough voters to make sure they stay in office. And isn't it ironic that Ken Blackwell, former Secretary of State of Ohio and owner of Diebold stock and co-chair of the Relect Bush/Cheney '04 campaign is himself an African American. What a traitor he is, not only to his own ethnicity, but to the entire American electoral process. He, along with Tanner, should be summarily tried, convicted and shot for treason. Thank you for keeping up the fire - YOU, my friend, are a true American hero!